What’s an arborist? If you notice the similarity to Arbor Day, you can figure out the word has something to do with trees. But what does an arborist do exactly and what’s the connection to home improvement? Let’s find out. What is an arborist exactly? An arborist is someone trained in arboriculture (the care of trees). These professionals are sometimes called “tree surgeons,” but the title “tree doctors” is actually more accurate, because it better describes the full skill set involved. 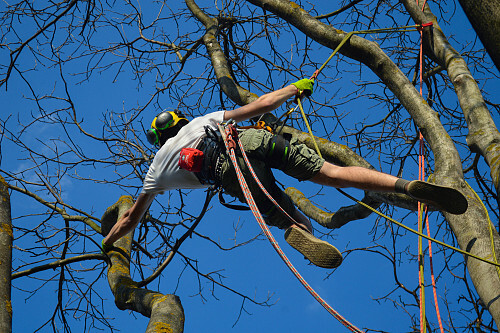 A certified arborist is one who has been credentialed by the International Society of Arboriculture, based on a combination of practical tree care experience and a comprehensive exam. Repair of trees damaged by nearby construction, vehicular impact, etc. Planting trees will beautify and shade your home. It also makes your house more attractive to potential buyers, when you're ready to sell. Your arborist will help you prepare a plan before planting trees on your property. He or she may test your soil, assess the yard layout and available space, and consider your local climate zone in order to choose the best species and arrangement for your yard. A skilled arborist can also predict and prevent future problems, such as rapidly growing trees that will shade your garden more than you want or tree roots that might interfere with your driveway or house foundation. In terms of the actual planting, you’ll receive expert advice such as choosing healthy young trees for your yard, bare root vs. balled and mulched or containerized, ground preparation, hole size and shape, and the correct depth and spacing. Small seedlings are best for planting in a residential setting. As long as they have healthy root systems, they’ll survive the stress of being moved much better than older trees. Immediately after planting, water the saplings deeply. They will continue to need regular watering for their first 2 years; consult your tree service specialist as to the correct quantity. Hold in moisture and reduce weed growth with natural mulch, such as wood chips or lawn clippings. Fertilize sparingly and remember that trees have different nutritional needs from non-woody plants; slow-release formulas are recommended. Some newly planted trees will need careful staking, which also serves to protect them from other inhabitants of your outdoor space, like children or pets. Tree trimming may be advised in a number of situations. Moderate thinning of branches will allow a young tree to develop a strong structure and permit light and air to reach inner limbs. Dead or diseased branches are not only ugly, but also dangerous. Left untrimmed, they can easily break off in stormy weather and might fall on your car, your house, or even a passerby. In addition, pruning may be advisable when tree branches are perilously close to electrical lines. Although complete tree removal is a sad occasion, it is sometimes necessary when the tree is potentially hazardous -- dying, leaning dangerously, seriously diseased, or full of insects that are likely to spread. Always have tree trimming or removal done by an experienced arborist, who will be prepared with the proper safety equipment and know-how (not to mention insurance!). Discuss in advance how he or she plans to direct the falling branches, treat pruning wounds, and minimize harm to the tree, as well as what is to be done with the wood. If it is not diseased or infested, you might ask your arborist to chop into manageable sections so you can recycle it as a DIY decor project.